Have you meditated on Psalm 46? It is a lovely song that was directed to the “chief Musician for the sons of Korah”. Here are some of the things that came to mind when I took some time to think about this lovely piece of Scripture that reminds me that we should always praise God for He is our Shelter. Psalm 46 – To the chief Musician for the sons of Korah, A Song upon Alamoth. This is one of 11 Psalms in the Bible that were written for the sons of Korah. I found it interesting to learn that Korah was a grandson of Kohath, who was one of the Levites responsible for carrying the items (upon his shoulders) that were needed for the tabernacle that moved from place to place. Like his father before him Korah was essentially responsible for the care and upkeep of the tabernacle and Eleazar (Aaron’s son) was their supervisor. Korah was one of the leaders of about 250 men that began to challenge the right of Moses and Aaron to the priesthood because they no longer wanted to be the caretakers, rather they wanted to be priests. Moses disciplined the rebellious Korah and his men before the Lord and the Lord purified the people putting an end to Korah and the other rebellious men. However there remained Korah’s young sons that God spared for another purpose. We can read in the book of 1 Chronicles and 1 Samuel that after seven generations the prophet Samuel came out of the line of Korah. Remarkably we learn that some of the sons of Korah became great music leaders during the reign of King David. You will see that this Psalm is a praise anthem to our great God, the one who provides shelter. Now, imagine that this song is sung in soprano voices, which is what “Alamoth” means . Psalm 46:1-3 God is our refuge and strength, A very present help in trouble. Therefore will not we fear, though the earth be removed, And though the mountains be carried into the midst of the sea; Though the waters thereof roar and be troubled, Though the mountains shake with the swelling thereof. Selah. The Psalmist reminds the reader that no matter what happens … even if the mountains are carried into the midst of the sea (as they were in Noah’s day). Or if we have great earthquakes and other natural disasters, God is the One who protects and strengthens us. And then after verse 3 the Psalmist uses the word “Selah”, which many will say means to meditate upon this, however, in this piece I believe it is a musical denotation to pause the music and the song for several measures — perhaps to meditate upon what you just heard. Psalm 46:4-7 There is a river, the streams whereof shall make glad the city of God, The holy place of the tabernacles of the most High. God is in the midst of her; she shall not be moved: God shall help her, and that right early. The heathen raged, the kingdoms were moved: He uttered his voice, the earth melted. The LORD of hosts is with us; The God of Jacob is our refuge. Selah. More about God’s creation and how He is the one Who controls all. We see God in all of creation, and just as He spoke it into existence, He opens his mouth and corrects His creation (rebellious people) when necessary. Some other Bible references that talk about God and creation are found in Psalm 24:1-2, Psalm 33:6-9, Psalm 89:11, Colossians 1:16 and Revelation 4:11. I hope you look up these Scriptures and study them as well. Psalm 46:8-11 Come, behold the works of the LORD, What desolations he hath made in the earth. He maketh wars to cease unto the end of the earth; He breaketh the bow, and cutteth the spear in sunder; He burneth the chariot in the fire. Be still, and know that I am God: I will be exalted among the heathen, I will be exalted in the earth. The LORD of hosts is with us; The God of Jacob is our refuge. Selah. The song ends on a very somber note declaring that God not only shows His power in destruction, war and fire, but His power is also in the stillness — “Be still, and know that I am God”. We can seek Him even in the quiet of our prayer time with Him. He deserves the glory for all that He has done. 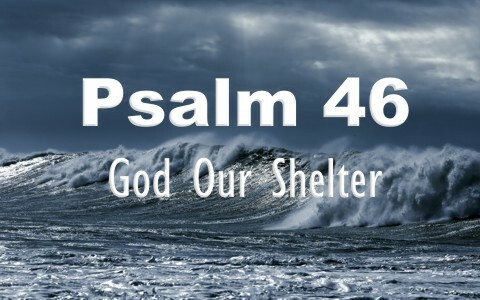 Most especially for the shelter that He provides for us in the storms of life. One of my favorite things to do when I am meditating on the word of God is to find cross references and even some historical background to what I am reading. This sheds light on the Scriptures and helps me to understand the context. I pray that you were encouraged with this little study and commentary on Psalm 46, a beautiful song to our Most High God. Previous post: How Do We Know When God Is Disciplining Us?